President Trump said on Twitter on Monday that the U.S. was cutting off aid to Guatemala, Honduras, and El Salvador because they hadn’t stopped “people from leaving their country and coming illegally to the U.S.” The remarks are significant: For decades, the United States criticized totalitarian regimes that didn't allow their citizens to leave in violation of international norms. Now, by demanding that these three countries stop their citizens from leaving, Trump is breaking from that precedent.The tweet reiterated a threat the president made last week to a caravan of about 7,000 migrants traveling from Central America to the United States via Mexico. 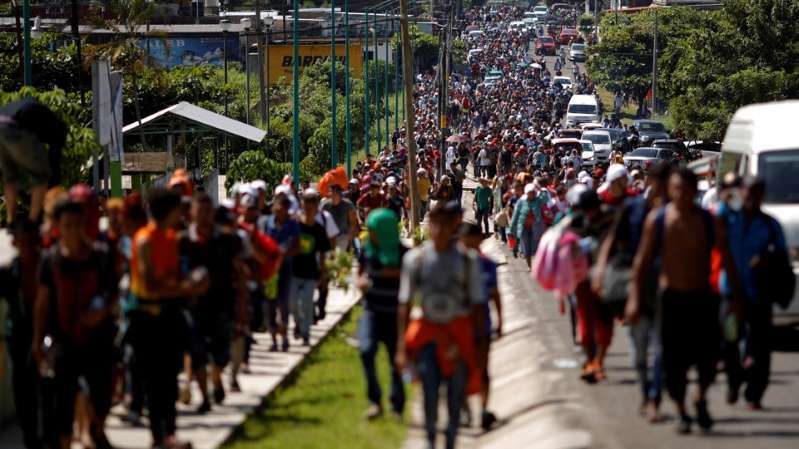 The group could reach the U.S. border as soon as this week—if Mexican authorities permit them to cross their territory. During the Cold War, communist countries routinely forbade their citizens from leaving. Nowhere was this more evident than in the Soviet Union. Moscow not only insisted that potential migrants, especially Jewish ones, obtain an exit visa to leave, but routinely denied such visas, and then labeled the applicants, who came to be known as refuseniks, as disloyal to the country and persecuted them. The United States led the West’s opposition to that policy. In 1974, Congress passed the Jackson-Vanik Amendment, which, in effect, made the normalization of trade relations with the Soviet Union and other communist countries conditional on their compliance with free emigration policies that are required under international treaties. Scholars differ over whether the Jackson-Vanik Amendment achieved its intended goal. Its supporters say it pressured the Soviet Union to reassess its policy while its detractors said it merely increased tensions with Moscow. At times, depending on what Moscow needed from the West, the Soviets permitted their citizens to leave in varying numbers. Emigration restrictions are far rarer in the post-Cold War era, where the accelerated process of globalization has made the very idea of such restrictions seem not only draconian but quaint. For instance, there are striking differences between the case of the Central American migrants and that of the Soviet refuseniks. “We didn't have an influx of people coming from Russia or the Soviet Union, as the case may be, across the border, into the United States at that time. So it was easy for the United States to say that Soviet Jews or evangelical Christians had the right to leave,” Bill Frelick, the refugee-rights program director at Human Rights Watch, told me. The United States took some, but not all of these migrants after screening them and interviewing them for health and security concerns. "It's a much different set of circumstances than people that are irregularly moving, that don't have documents, that don't have screening,” Frelick said of the situation in Central America. “It's chaotic and it's not managed." Absent such screening, the chaotic nature of the Central American migrant caravan bolsters the concerns many U.S. immigration restrictionists have about who the country is letting in. Some of the migrants in the caravan will almost certainly have a legitimate reason to flee their home countries; others are making the journey for economic opportunities or perhaps to join their families already in America. Separating such cases in an already overburdened system is likely to take time and create controversy. But as Frelick put it: "There isn't a right to immigrate and it's legitimate for countries to deport people that don't have a right to enter or stay. But there are exceptions to that—and the need for protection is a recognized exception to the rule."